The Code of Conduct constitutes the basis of compliance activities at KSB. 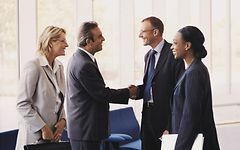 It describes the key legal and business policy principles that we use in our relationships with customers, suppliers and other business partners as well as our internal cooperation. It also determines our conduct on financial markets and in the various countries in which we work. The Code aims to support employees in their day-to-day work.